Generation and characterization of human megsin transgenic mice. (a) Megsin transgene construct. 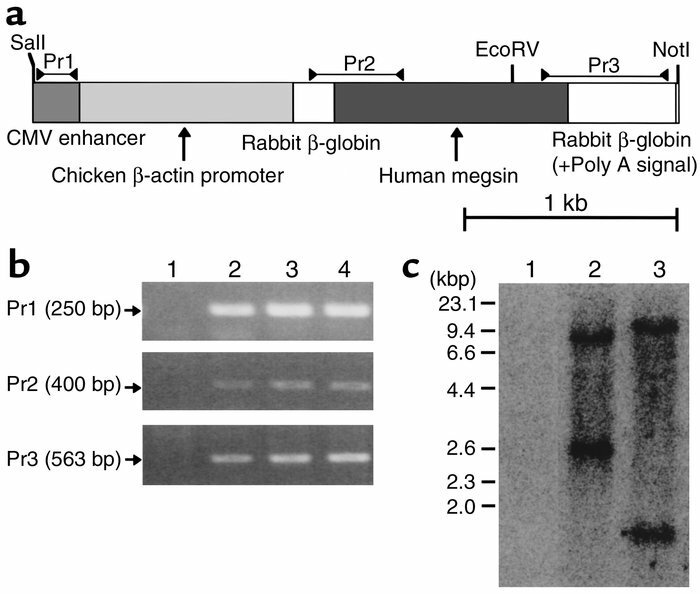 Full-length human megsin cDNA was subcloned in the rabbit β-globin gene including a part of the second intron, the third exon, and the 3′ untranslated region. The positions of primers for PCR analysis are indicated above the construct. (b) Identification of human megsin transgene by PCR of genomic DNA. Lane 1, a wild-type mouse DNA; lane 2, a wild-type mouse DNA with one copy of megsin transgene added; lane 3, F0 megsin transgenic DNA (line A); lane 4, F0 megsin transgenic DNA (line B). (c) Identification of human megsin transgene by genomic Southern blot analysis. Southern blot analysis after EcoRV digestion of genomic DNA. Lane 1, a wild-type mouse DNA; lane 2, F0 megsin transgenic DNA (line A); lane 3, F0 megsin transgenic DNA (line B). Approximately 9.0 kb and 2.6 kb of fragments in line A and 10.0 kb and 1.5 kb of fragments in line B, but not endogenous murine megsin genome, are detected with human megsin transgene probe.